The Crow: Salvation (2000): This is the third Crow movie. I like it even better than the first movie. For some silly reason, this movie just went straight-to-video. I've heard that they played it to test audiences with less than enthusiastic results so they didn't even attempt a theatrical release. This makes no sense to me. By far and away, the quality of this film is better than the original "The Crow". The filming is better, the action is more elaborate, the cast (on the whole) is better...this is filmed more like a real movie, whereas "The Crow" was definitely an independent feature by means and design. I'm not putting down "The Crow" movie at all, I just like "The Crow: Salvation" better. This is not a continuation of the first or even second movie ("The Crow: City of Angels" from 1996). 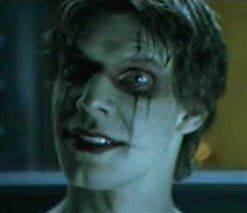 This is a brand new Crow character by the name of Alex Corvis, played winningly by Eric Mabius. Wrongly electrocuted for the murder of his girlfriend, Corvis comes back from the dead to find the real killer! This time, with spooky face, superhuman strength and invincibility, a mysterious crow, and his girlfriend's sister (played by Kirsten Dunst) he untangles a twisted web of lies and corruption. 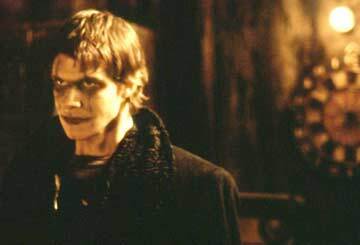 Things get really wild when The Crow uncovers a conspiracy that involves his girlfriend's father (played by William Atherton) and the chief of police (played by Fred Ward). Ward's character is worth elaborating upon. This crooked policeman is absolutely despicable. He has no redeeming qualities and is truly, truly evil. There is no amount of good in him. And when he finally gets killed in the movie, it's a movie death worthy of the character. Well done...literally and figuratively. Grant Shaud (From TVs "Murphy Brown") has another great role as another sidekick of Alex Corvis/The Crow. He's the lawyer who defended Corvis all the way up to the time of his death and just about as fine a fellow as you'd ever hope to meet. There aren't too many lawyers this friendly in real life, so it's nice to see this in film. This movie is definitely not for kiddies. It's rated R for all the right reasons. The basic theme of this movie, which I've already discussed, should tip you off. More than that, it is really, truly violent and the villains are all psychologically intense. A lot of what happens in this movie is gross. It's a great escape for us adults when we're in a foul mood and need release, but no young child should ever see this. Plus, I don't think a lot of young children would understand the complex plot. For the rest of us, though, this is a movie well worth seeing. It's very stylistically done and is quite a triumph for the action movie genre.